Lioness brought tears to my eyes and also warmed my heart. It focuses on five Army women serving in Iraq. Coming from all different backgrounds, these women have one commonality: military service and Iraq. The lioness tag. This means that they are the first women in U.S. military history to be sent into direct ground combat. As the documentary unfolds, it shows that these women’s services are absolutely integral to the success of the U.S. military. A plethora of Iraq War documentaries are out there. What makes this any different? Most of those tell men’s stories or from men’s viewpoints. Lioness is the story you have yet to hear. The women are remarkable and winning. They provide a revealing perspective on the Iraq War. 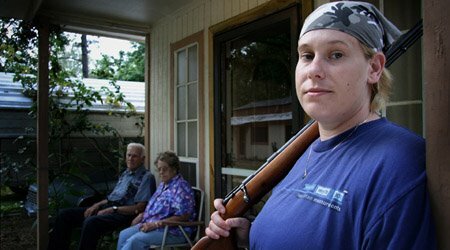 There’s redneck Shannon, the most affected by her tour of duty. She’s on meds and shooting turtles in the swamps of Arkansas. In a telling moment she remarks, “I really wish I had kinda lost my mind or something . . . I lost a part of me.” The film nicely introduces each woman and then tells the often uncomfortable, upsetting and maddening story of their military service. This is the untold story of Iraq. Lioness is a phenomenal tour-de-force from directors Meg McLagan and Daria Sommers. It is a vital, potent film that illuminates another aspect of the war through women’s voices. Ones that are not often heard. This entry was posted on October 15, 2009, 18:08 and is filed under DVD. You can follow any responses to this entry through RSS 2.0. Both comments and pings are currently closed.